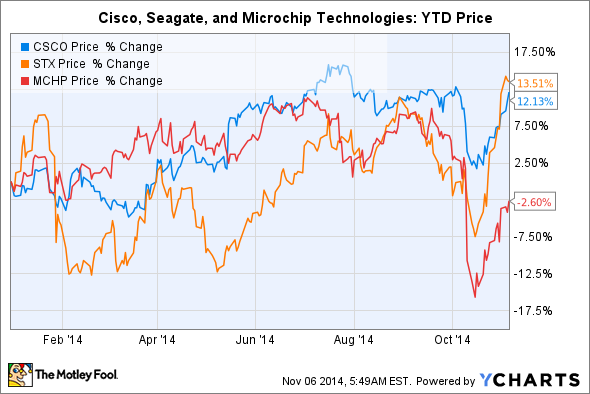 Income investors should look at Cisco, Seagate, and Microchip Technology, which all offer yields exceeding 3%. Therefore, let's look at three tech stocks -- Cisco (NASDAQ:CSCO), Seagate Technology (NASDAQ:STX), and Microchip Technology (NASDAQ:MCHP) -- that all offer annual yields exceeding 3%. Networking giant Cisco has consistently boosted its dividend since introducing the payout in 2011. Looking ahead, Cisco has a forward annual yield of 3.1% and trades at 11 times forward earnings. While its dividend and valuation look tempting, there are problems with Cisco's core business. Cisco's two biggest businesses -- switches and routers -- respectively comprised 38.9% and 21.2% of its revenue in fiscal 2014. But sales of switches fell 4.8% while revenue from routers dropped 7%. The main bright spots of growth for Cisco were its data center, wireless, and security segments, but those three businesses only accounted for 17.9% of the company's top line. Cisco's data center business, which uses its high-end UCS servers, is considered an opportunity to tap into the growing need for cloud-based solutions. Unfortunately, Cisco entered that market quite late -- IDC estimates the company only controls 5.9% of the server market, compared to Hewlett-Packard's 25.4% and IBM's 23.6%. However, Cisco has been leveraging its dominant position in networking equipment (about 60% of the ethernet switch market) to bundle other products and services at discounts to gain market share among enterprise customers. This could impact the company's bottom line in the short term, but it could also help its top-line growth get back on track. Hard-drive maker Seagate pays a forward annual yield of 3.4%, has been increasing payouts since 2011, and is also trading at 11 times forward earnings. Seagate's earnings per share has declined dramatically since 2012. Between fiscal 2012 and 2014, Seagate's annual net income plunged 45% to $1.57 billion, although its revenue only fell 8% during that period. The company has compensated for those top- and bottom-line declines by repurchasing shares. In 2014 alone, it spent $1.9 billion on stock buybacks and another $557 million paying out dividends, which together represented about 97% of its free cash flow. Seagate is in the middle of two technological transitions -- the first from slower HDD (platter-based hard drives) to faster SSD (solid-state drives), and the second from PCs to cloud servers. Seagate controls 40% to 50% of the global HDD market, but barely has a presence in the SSD market, which is dominated by Samsung. This is problematic, since many newer laptops and convertible devices use SSDs. However, both Seagate and its main rival, Western Digital, have found new life in media-hosting cloud servers, in which cheaper HDD capacity, not access speed, matters the most. As a result, only about half of Seagate's revenue comes from PCs, while the rest is derived from cloud-based server drives and new investments in SSDs and hybrid (SSD/HDD) drives. If Seagate stays on that path, its growth on the top and bottom lines could stabilize. Microchip Technology, a manufacturer of specialized semiconductor products, offers a forward annual dividend yield of 3.3%, and trades at 15 times forward earnings. Between fiscal 2011 and 2014, the company's annual revenue rose 30% while it boosted its dividend through thick and thin earnings. Microchip Technology's business can be volatile because its chips, which are used across a wide variety of industries, can experience seasonal ups and downs. Microchip's main products are MCUs (microcontrollers) -- tiny all-in-one computers that can be installed in smart appliances, driver-assistance systems for cars, digital thermostats, and other devices connected to the Internet of Things, or IoT. MCUs accounted for 66% of the company's top line last quarter, when its generally accepted accounting principles-adjusted revenue climbed 10.9% year over year to $528.9 million. However, net income fell 6.2% to $99.8 million as operating expenses jumped 20.3%. Looking to the near future, Microchip has rocky expectations for the MCU business, citing an "industry correction" for itself and its competitors. Despite these problems, investors interested in the growth of the IoT market, which Gartner expects to increase by 36.2% next year, should take a closer look at Microchip Technology, which pays out a decent dividend for those willing to ride out its near-term volatility.